French sculptor, painter and printmaker, celebrated for his portrayal of animals. He laid the basis of his extensive knowledge of animal forms while employed by a goldsmith making models of animals in the Jardin des Plantes, Paris (1823-31). His work was in the spirit of Romanticism , particularly his preference for rendering violent movement and tense posture. He also did the pediment Napoleon dominating History and the Arts on the Pavilion de l Horloge of the Louvre and an equestrian statue of Napoleon at Ajaccio, the Emperor s birthplace in Corsica. 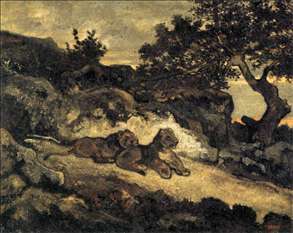 Although he was a successful monumental sculptor, he also created a considerable body of small-scale works and often made multiple casts of his small bronze designs, marketing them for a middle-class public through a partnership, Barye & Cie. His interest in animal subjects is also reflected in his many watercolours. 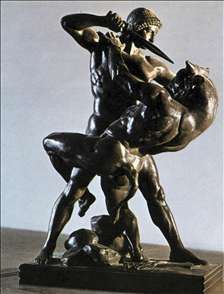 He thus challenged several fundamental values of the Parisian art world: the entrenched notion of a hierarchy of subject-matter in art, wherein animals ranked very low; the view that small-scale sculpture was intrinsically inferior to life-size or monumental work; and the idea that only a unique example of a sculptors design could embody the highest level of his vision and craft. 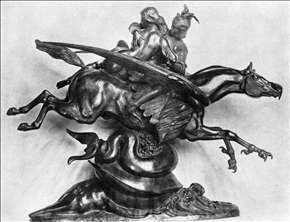 As a result of his Romantic notion of sculpture, he won few monumental commissions and endured near poverty for many years. See more details about "Bull Attacked by a Bear"
See more details about "Tiger Devouring a Gavial Crocodile of the Ganges"
See more details about "Theseus Slaying the Minotaur"
See more details about "Roger and Angelica"
See more details about "Lions near their Den"